Do you suffer from wrist pain, numbness or tingling associated with Carpal Tunnel Syndrome? Are you looking for a treatment that works? Carpal Tunnel Syndrome is a condition where the median nerve in the wrist that supplies feeling and movement to parts of the hand becomes compressed. Compression of this nerve can lead to numbness, tingling, weakness, or muscle damage in the hand and fingers. It is the most common repetitive motion injury in the work place and accounts for 1% of workman’s compensation claims. Risk Factors: People who use their hands and wrists repetitively such as computer users and typists, occupations involving heavy labour such as meat and fish packing industry and pregnant women are at increased risk of developing Carpal tunnel Syndrome. ART – Active Release Techniques is an effective therapy used to treat carpal tunnel syndrome. ART is a system/movement based massage technique use to treat problems involving muscles, tendons, ligaments, fascia and nerves. Using specific movement techniques and precisely directed tension, pressure on the nerve can be released restoring nerve flow and function. Chiropractic Care: Chiropractors can diagnose and treat Carpal Tunnel Syndrome and other wrist/hand related conditions. Various treatment options (ie: ART - soft tissue therapy, acupuncture, stretches, exercises) may be used to help to decrease pain and restore movement. Carpal Tunnel Syndrome can be quickly and effectively treated with ART. Chiropractic Care can help you get back to your daily activities with less pain and improved function. Don’t let your Carpal Tunnel Syndrome stop you from engaging in your daily activities, see Dr. Lisa today! Call Mississauga chiropractor Dr. Lisa Ramsackal for effective Active Release Techniques (ART) treatment for Carpal Tunnel Syndrome that lasts. Do you have shoulder pain? Is the pain worse with overhead activities? If so, you may be suffering from Biceps Tendonitis. Biceps tendonitis, also called bicipital tendonitis, is inflammation in the main tendon that attaches the top of the biceps muscle to the shoulder. Biceps tendonitis may develop gradually over time from the effects of wear and tear or suddenly from a direct injury. 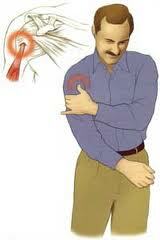 Symptoms: Deep ache directly in the front and top of the shoulder that ache may spread down into the biceps muscle. Pain is usually made worse with overhead activities and resting the shoulder generally eases pain. The arm may feel weak with bending the elbow or when twisting the forearm with the palm facing up. Causes: Continuous or repetitive shoulder actions can cause overuse of the biceps tendon causing wearing down and damage to the tendon. Years of shoulder wear and tear can cause the biceps tendon to degenerate, become inflamed and painful. Biceps tendonitis can also happen from a direct injury, such as a fall onto the top of the shoulder. Risk Factors: This is common in sport or work activities that require frequent and repeated use of the arm, especially with overhead movements. Athletes who throw, swim, or swing a racquet or club and gymnasts are at greatest risk. Biceps pain may be a symptom of other more serious injuries such as rotator cuff tears or shoulder instability and should be assessed if the pain persists for more than 2 weeks to avoid further injury. Chiropractic care can help with the diagnosis and treatment of Biceps Tendonitis and other arm/shoulder related pain. Various treatment options (i.e. acupuncture, electrotherapy, stretches, and exercises) may be used to help to decrease pain and restore movement. Biceps Tendonitis responds well with conservative treatment. Chiropractic Care can help you get back to your daily activities with less pain and improved range of motion. Don’t let your arm pain stop you from continuing with the sports/activities that you enjoy. With appropriate treatment, you can get back into the game. For effective chiropractic treatment for biceps tendonitis call Mississauga chiropractor and Acupuncturist Dr. Lisa Ramsackal.